This amazing safari offers to give you an experience of finding the hidden treasures of Africa. You can become a part of the rich wildlife in Africa, where you will hear the roar of lions, the call of hyenas, and the grunting of hippos. You will become one with nature and enjoy the thrill of observing the animals in their true colors. Choose from a variety of activities and take back with you memories of an exciting holiday covering the cultural and natural diversity of this magical country! Children policy: Minimum age allowed for participation is six and participating children need to be supervised is under age 12. Bushwise Safari Lodge is a lodge that combines the real Kruger safari experience with accommodations boasting a unique ambiance. All the rooms are air-conditioned and furnished with a rustic and ethnic touch, inspired by the African bush. All rooms have ceiling fans, air-conditioner, and mosquito screens in front of all the doors and windows. The bathrooms are en-suite with showers and one room is available with a bathtub. The lodge has an upper deck with swimming pool and bar area with amazing views of the Kruger Park and the Crocodile River. There are spa treatments available at a beauty spa nearby, these can be booked at an additional cost. Enjoy a leisurely walk on the border of the Kruger Park along the banks of the Crocodile River with a field guide, who will enlighten you with his knowledge and his passion for the African bush. Zebra, blue wildebeest, kudu, warthog, and giraffe are just some of the game that you might encounter on the walk. The guide will also point out the amazing variety of bird species and trees in and around Kruger. Participants of all ages are welcome. Get up close and personal with the elephants. You will go to a game farm to meet these magnificent animals of Africa. They will allow you to touch and exchange greetings with the elephants and experience their exceptional intelligence for about half an hour. There will be a number of stops during the day, in one of which you will have the opportunity to buy yourself lunch. Experience the African bush and wilderness at its best. The Kruger Park boast over 140 animal species, including the big five (lion, leopard, elephant, rhino, and buffalo) and over 500 birds species. All ages welcome. This safari will take place at Kruger National Park in South Africa. The park is one of the most unspoiled natural ecosystems left in Southern Africa. It is a 20,000-square-kilometer park that houses the five most dangerous species to hunt: elephant, lion, leopard, rhino, and buffalo, which are known as the big five. You can also encounter other big animals, such as giraffe, hippo, cheetah, wild dog, and hyena. This wildlife area is also home to some 33 species of amphibian, 115 species of reptile, and 140 species of mammal, including all the big game species that were nearly wiped out by the hunters of the nineteenth century. Approximately 470 bird species have been recorded there, more than half of Southern Africa’s total. 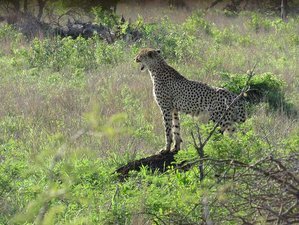 The southeastern part of Kruger is well known for its superb game viewing, with frequent sightings of lion and leopard. Upon leaving O.R. Tambo Airport (JNB), follow the road signs onto the R21S Boksburg. About nine kilometers after Hectorspruit, you will see a sign that reads Marloth Park. About four kilometers further, take the Tenbosch turn-off which is a tar road. About three kilometers further, you will find a road sign on your left-hand side that reads "Waterbok Street." Continue for about one kilometer until you see a T-junction with the river and Kruger Park in front of you. Turn right five meters before the T-junction at the "Bushwise Safaris and Lodge" sign. Please book your flight to arrive at Kruger Mpumalanga International Airport (KMIA). Transfer from and to the airport is included. Bushwise Safaris will pick you up from the airport.